The Medical Research Council (MRC) Epidemiology Unit at the University of Cambridge in the UK, has determined that exercise reduces the risk of death. 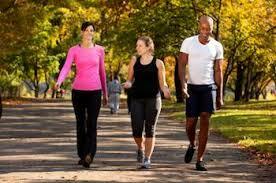 The researchers found that lack of exercise had a more detrimental health impact than obesity. The research findings are based on data of 334,000 men and women taking part in a large European study investigating the links between cancer and diet that also measured many other variables such as exercise and BMI. The dataset included measures of height, weight, waist size and self-reported physical activity levels. The participants were followed for over 12 years, during which time 21,438 of them died. The results reflect that compared with the number of deaths linked to obesity, twice as many were linked to lack of physical activity. Even a small increase in physical activity could make a difference, especially among inactive people.The greatest impact and reduction of risk of early death was found when inactive and moderately active participants were compared. The analysis found that doing exercise that burned just 90-110 calories a day – the equivalent of a daily 20-minute brisk walk – was enough to move an individual from the inactive to the moderately inactive group and reduce their risk of early death by 16-30%. Just a small amount of physical activity each day could have substantial health benefits for people who are physically inactive, said Prof. Ulf Ekelund, the lead author of the study. Physical activity and all-cause mortality across levels of overall and abdominal adiposity in European men and women: the European Prospective Investigation into Cancer and Nutrition Study (EPIC), Ulf Ekelund, et al., Am J Clin Nutr, doi:10.3945/​ajcn.114.100065, published online 14 January 2015, abstract.